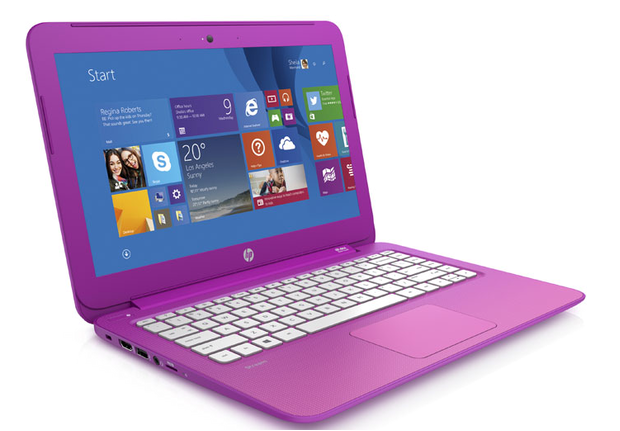 HP has unveiled low-cost Windows 8.1-based Stream notebooks and two Windows 8.1 Stream tablets. If bright blue and purple notebooks make you happy at work, then HP's two new Windows 8 Stream notebooks could be your next device, thanks to a price tag that undercuts HP's new Chromebook lineup and a rather sizeable chunk of cloud storage. Priced to compete head on with Chromebooks and aimed at consumers who want to "work and play", the 11.6-inch HD display Stream will be available for purchase in the US from November from $200, while the 13.3-inch Stream will be available from $230. Like Chromebooks, Stream devices are meant to operate mostly through a browser with enough additional chops, thanks to Windows, to run apps locally. They also come with a bevy of Microsoft extras, including 1TB of OneDrive storage for a year, though that's a special introductory offer, which may dial back to the original 200GB slated for the devices. The HP Stream notebooks also include a one year subscription to Office 365 Personal, and a $25 gift card to spend on apps, videos or Xbox games from the Microsoft Store. The larger HP Stream will also include an optional 200MB of free 4G data each month from T-Mobile, although that's a limited time offer. It's also the only model available with a touchscreen option. The two new devices join the recently announced 14-inch HP Stream notebook, which starts at $299, but instead of an AMD processor, the smaller notebooks are powered by an Intel Celeron processor and have 32GB of eMMC flash memory. According to HP, the 11.6-inch Stream has an eight hours and 15 minutes battery life while playing HD video, while it's up to seven hours and 45 minutes for the 13.3 inch device under the same conditions. Also launching from HP are two new tablets, the Intel-based HP Stream 7 and HP Stream 8, which again are Windows 8.1 based devices and similarly come with extras from Microsoft. As their names suggest, the new tablets have seven-inch and eight-inch displays, and come with a one year Office 365 subscription, and 1TB of OneDrive storage for one year. The Stream 8 includes the same 4G data deal as the 13.3 inch Stream notebook. The HP Stream 7 starts at $100, while the HP Stream 8 starts at $150.